Not shown is an iPhone 4S, which was used to take the picture. 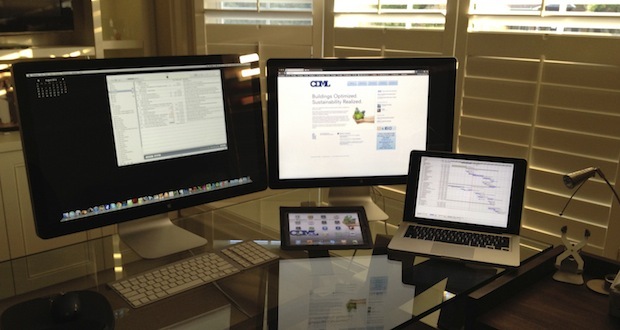 We’ve said it many times before, but having multiple displays can really boost productivity. If you don’t have an external screen yet, it’s certainly worth considering the investment. Call me crazy, but those monitors do not look like they are the same size. More like a 27″ and a 21″. I think you are right, I think one is a 24″ and the other is 27″! Apple has already stated they will be completely updated next year. Sweet. The monitors look different sizes…optical illusion? The glass desk is a nice touch!! I have a couple of dual monitor setup’s at work and they definitely help productivity. Great Site, fun thread & plenty of helpful tips last month. Great work Guys!! Adding an Apple TV for nothing else but to work the iPad via Reflection would be nice. Great looking setup indeed. Just curious, anyone knows what calendar app is shown on the left screen? The calendar app is in fact iTunes, which I use to play mellow music while working. I think the reference was to the desktop calendar in the top left hand corner of the monitor. Ah, the top left small Calendar app is a Yahoo widget called Month Calendar. I use it as it is unobtrusive and great for quick date checks. I greatly enjoy your series on Mac Setups but increasingly have difficulty believing they are representative of the (Mac) working masses. Let’s face it, most of us work in an environment which is at the intersection of chaos and confusion. Coffee cups here, scraps of paper, pens and pencils there. Not to mention a half dozen 3M PostIt notes stuck in any place which will take them. Maybe some setups which speak to the real rather than the ideal would help level the playing field for those like me who aspire to your standards while knowing they are not reachable? The lack of clutter on the desk top is quite real, I have tendency towards OCD in my work flow and try to have only the item I am working on, on my desk top. Adam – I do not doubt for one moment it’s real. But you are Felix to us Oscars out there. And Oscars are in the majority, I suspect. Love this desk arrangement and thread! Keep them coming! The keyboard is a Apple Bluetooth keyboard with a third party bluetooth “LMP” num pad added on. I do a lot of number crunching and cannot live without a num pad. That macbook looks thinner than normal, must be the glass desk. Or is it the coming MacBook 13″ retina! The MacBook is a 2009 13″ MacBook Pro. After 2 years it was getting slow but I had a SSD installed and it is better than new, best $400 I ever spent.